PHILADELPHIA — The No. 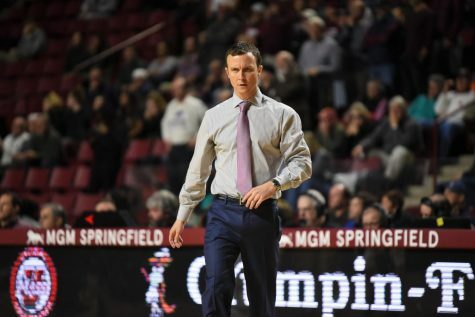 21 Massachusetts men’s basketball team found itself in an all too familiar position at the end of its game at Saint Joseph’s on Saturday. 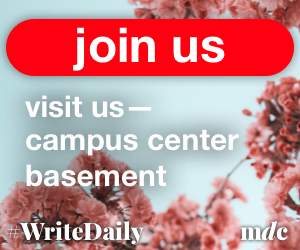 Only this time, the script was written differently. 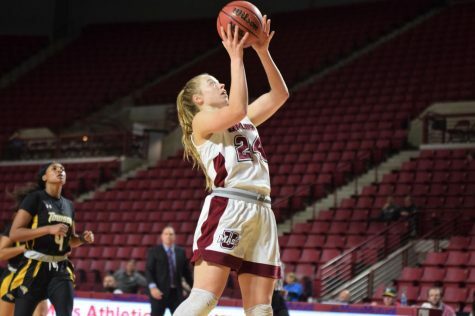 Trailing by as many as 17 points in the first half, UMass fought all the way back to tie the game at 68-68, but failed to score after that, falling to St. Joe’s 73-68 in front of 4,200 fans at Hagan Arena for their third straight road loss. Down 16 points at halftime, the Minutemen (17-4, 4-3 Atlantic 10) opened the second half on an 11-5 run to cut the deficit to single digits. Sophomore Derrick Gordon led the UMass rally, scoring 16 of his game-high 21 points in the second half. 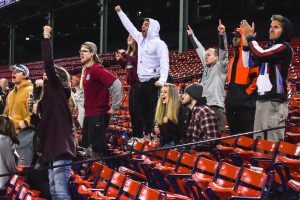 Gordon’s performance was just enough to give Chaz Williams a chance to get going offensively, and he responded. 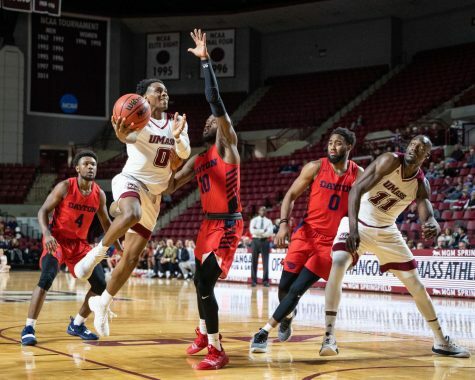 Williams scored nine straight points for the Minutemen late in the second half and it was his assist to Gordon that led to the game-tying layup at 67-67. 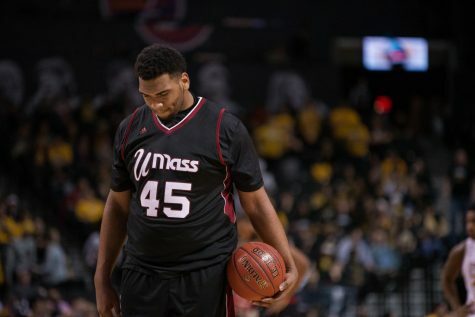 But that was the final high point of the game for UMass. The Hawks (15-6, 5-2 A-10) ended the contest on a 6-1 run that was aided by a pair of missed go-ahead tip-ins by the Minutemen. 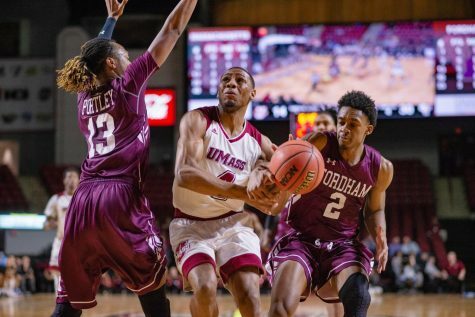 UMass held a 10-9 advantage five minutes into the game, but never saw the lead again. 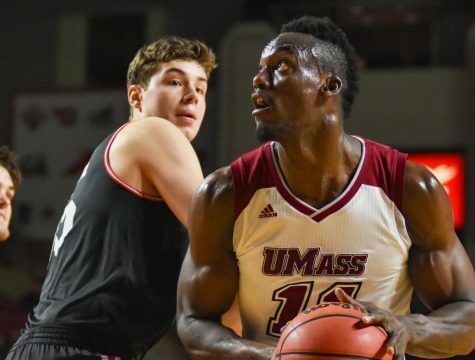 The Minutemen were plagued early by foul trouble to Sampson Carter, Cady Lalanne and Raphiael Putney, forcing Kellogg to juggle his lineup early and often. To make matters worse, Maxie Esho took a hard fall late in the first half and did not return seen, holding a bag of ice wrapped in a towel above his right eye during halftime. 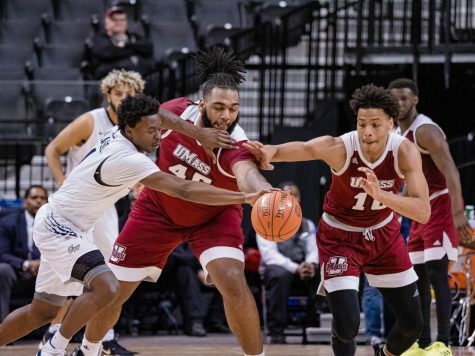 St. Joe’s played to the sold-out crowd and inconsistent officiating, dominating UMass in every facet of the game in the first half. The Hawks’ 39-22 lead with just over a minute left in the first half was the largest deficit the Minutemen faced all season. 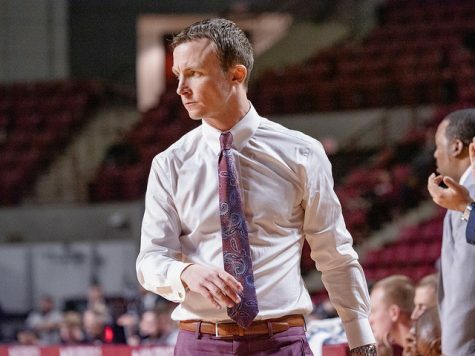 St. Joe’s was keyed by the presence of Ronald Roberts Jr. and Halil Kanacevic down low. The two combined for 35 points, while playing all but two minutes between them. 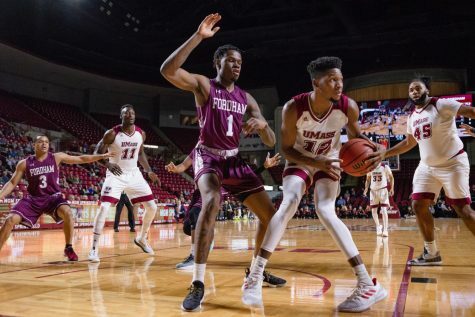 Saturday’s loss wraps up a treacherous stretch of games for UMass, which played five of its previous six games away from home, going 3-3 during that span. 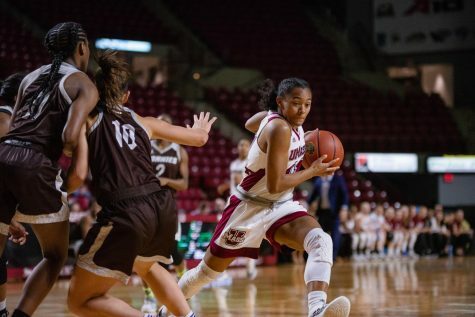 The Minutemen have little time to get over the loss, as they host La Salle on Wednesday at 7 p.m. It’s a golden opportunity for UMass to snap its first losing streak of the season, playing at Mullins Center, where it’s 9-0 this season.